A crib changing table combo can be an important piece of furniture for smaller nurseries. They take up less floor space than buying these two items separately, while providing a safe comfortable place for the baby to sleep and be dressed. In most cases, crib changing table combos also provide additional storage space as well. All of the crib portions of these crib changing table combo reviews are convertible cribs, which means that the bed portion can grow with your child. However, consumers need to keep in mind, that there are few, if any, convertible bed manufacturers that include the rails for the full size bed as part of the price of the crib, and very few that offer the rails for the youth bed as part of the price. These rails can be purchased separately at a later date. Stork Craft was formed in 1945 when Morris Feldstein stopped making his hand crafted furniture from his home and opened his first infant furniture manufacturing plant. His commitment to making the highest quality infant furniture possible helped this company rise to become one of the leaders in baby furniture today. This review will cover two products manufactured by Stork Craft; The Storkcraft Portofino 4-in-1 fixed side convertible crib changer and the Stork Craft Milan 2-in-1 fixed side convertible crib and changer. The Stork Craft Portofino 4-in-1 Fixed Side Convertible Crib Changer is a crib changing table combo that has a lot of style. The Stork Craft Portofino crib changing table combo is a beautiful piece of furniture made from solid wood and wood products. The drawers and shelves look like they provide plenty of space for storing small items. The fact that this crib can grow with your child makes it a money saving investment. Reviews for the Stork Craft Portofino 4-in-1 crib changer are amazingly good with this crib earning impressive feedback from customers from reviews across various sites on the internet. Most customers really liked this crib/changer and found it to be exactly what they wanted. While some customers found this crib/changer easy to assemble, others did not. However, the majority of those who found the assembly of this crib time consuming and difficult, felt that the finished product was well worth it. There were a couple of things that customers did feel could be improved. Overall, most customers who purchased this crib felt that they made the right decision and were thrilled with their purchase. They stated they would definitely recommend this crib to others. The Milan 2-in-1-crib combo is a simple elegant looking crib with a built in changing table. The clean lines should go with just about any nursery décor, and the storage shelves are plenty large enough to keep those entire baby changing supplies. 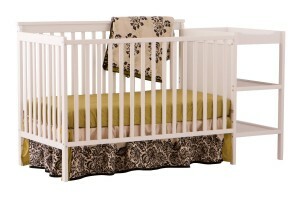 The Stork Craft Milan crib combo gets good reviews rating highly with customers. While most customers found this crib and changer easy to assemble, others found it somewhat difficult. How difficult this crib is to assemble may depend on your ability to follow the instructions, which most customers do believe could be clearer. 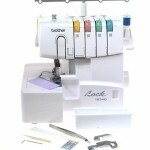 Overall, the Stork Craft Mila crib changer combo was well like by customers, in spite of these problems. The AGF Baby Furniture have been in business since 1986, and they are dedicated to making a variety of high quality baby furniture, of which the Athena Daphne Convertible Crib Changer is a fine example. The Athena Daphne convertible crib changer is a 3-in-1 convertible bed that has several nice features. 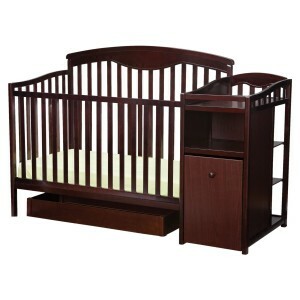 This crib is well designed for the safety of your baby, as well as allowing for the optimum amount of storage space. It is a clean and chic looking set that will fit well with almost any nursery décor. The Athena Daphne Convertible Crib Changer scores high in reviews scoring impressively with customers across the web. Most customers enthusiastically recommend this crib changing table combo. The Delta Children company manufacture safe, quality baby furniture, including strollers, chairs play yards, and of course cribs. The Delta Shelby Crib And Changer is just one of the fine products manufactured by this company. The rich espresso finish on the Delta Shelby crib and changer gives this piece of nursery furniture a sophisticated and wonder appearance, but there is much more to this crib changer combo than just a pretty facade. A lot of thought seems to have gone into the design of this crib and changer. The hamper is a nice touch, and the trundle on wheels as well as the small shelves, should provide well-needed additional storage while helping to keep all those necessities close at hand. Reviews for the Delta Shelby crib and changer combo are excellent, with this lovely piece of furniture scoring favourably with customers. Overall, most customers find the Shelby crib combo to be an excellent crib changer combo with lots of useful features, and state that would recommend this crib changing table combo to others who want a nice crib for their infants.